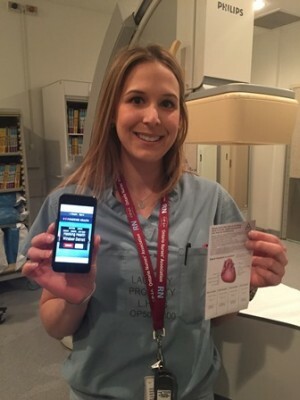 A Windsor Regional Hospital nurse takes the top prize at an international competition where mobile “apps” for the health care sector are designed and developed. Kaitlyn Sheehan conceptualized the app “Stent Tracker.” It’s a Web-based app that allows patients to store their cardiac stent information, manage their medication list, schedule reminders to take important medications, and provide an educational tool on heart health. Kaitlyn Sheehan, an RN in the cardiac catheterization lab at the hospital’s Ouellette campus, was the “Overall Judges Favourite” recipient at Hacking Health Windsor Detroit for the app she conceptualized called “Stent Tracker.” It’s a Web-based app that allows patients to store their cardiac stent information, manage their medication list, schedule reminders to take important medications, and provide an educational tool on heart health after a coronary angioplasty. With an app, all this information can be synced on a mobile device, rather than a patient card or pamphlet that could easily get lost. Kaitlyn came up with the idea herself, and assembled a team to help her design a prototype for the app, which will be further developed this year.